and USPS representatives in front of newly tested cargo trucks. New USPS cargo trucks and spotters were scheduled to begin deployment in April. The Postal Service conducted the First Article Testing (FAT) on the Ottawa Spotters and the Peterbilt 18' and 24' cab-over and cab behind engines. The spotters were tested in Ottawa, KS and the cargo trucks were tested in New Carlisle, IN. The purchase of these vehicles is scheduled to be one-for-one replacements of the present spotters and cargo trucks. In the opinion of the MVS operators who drove them daily, the replacement is long overdue. The normal replacement cycle of postal vehicles is eight years for trucks and 12 years for trailers. Many of these vehicles have over 1,000,000 miles, which is virtually unheard of in intra-city transportation, or the Postal Service. According to Article 39.3.B, the union has the opportunity to participate in the FAT and submit our observations within 14 days (copy of the Cargo Truck letter can be found on apwu.org). 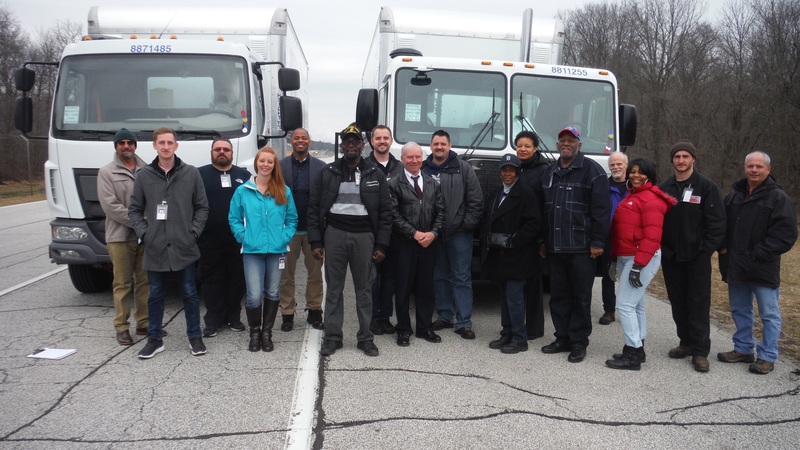 Various authorized APWU MVS Craft representatives from around the country participated in the FAT by observing and driving the new vehicles at both locations. Their overall opinions were that these trucks are a vast improvement over the present fleet and, with proper training and upkeep, should serve the USPS and our customers for years to come. Set the air cut off to 130 PSI (it is presently set at 120 PSI). The testing for cargo trucks was a more in-depth process. For the first time, cameras and pictures were not allowed because these tests were conducted on the NaviStar testing grounds. In the past, the union has always been allowed to take pictures of postal equipment. Cab-over model will cause some discomfort for our larger drivers. With the purchase of the new vehicles, the union hopes that someone in authority at USPS headquarters realizes the value of the PVS operators to the Postal Service and will abandon their efforts to contract us out. Thanks to the participants of both FATs.